SANTIAGO, Chile — For Nery Barrientos, it was the squeaking hinges on the giant iron gate outside Villa Grimaldi that did it. He suddenly froze. He was about to leave the park, but the noise sent shivers down his spine. Barrientos was describing his feelings after a February visit to Villa Grimaldi, a notorious torture center under the right-wing military dictatorship headed by Chile’s Gen. Augusto Pinochet. It was only one of many such centers throughout the country. Between 1973 and 1978, an estimated 4,500 men and women were held and brutally tortured at this former prison camp. Over 220 of them “disappeared” during their detention, never to be seen or heard from again. Eighteen others were executed on the grounds. Century-old trees have been joined by newly planted birches to provide shade along cobblestone walkways. Flower gardens grace many areas that were once the sites of horrendous crimes against humanity. The names of the dead are inscribed on a bronze wall, on large billboard-like panels, and in the case of the women, on small, commemorative plaques next to flowering roses. Some of those names belong to Barrientos’ friends. Barrientos himself was never detained here, although his own life was threatened by the Pinochet regime, forcing him and his family into political exile for nearly three decades. My wife and I became friends with the Barrientos family when we were all active in the Chile solidarity movement in the U.S. When we visited Nery and his wife in Chile in mid-April, he served as our unofficial guide to the estate. Villa Grimaldi’s history wasn’t always so grim, he said. For most of the 19th and 20th centuries, the estate was a gathering place for many of Chile’s artists and intellectuals. Over the decades its various owners hosted parties and cultural functions. Meeting rooms and entertainment halls were built. A theater was established, along with a school open to the entire community. The place was a gathering point for many left-wing and progressive cultural and political figures during the Popular Unity years, the period associated with the election of Salvador Allende, a Socialist, to Chile’s presidency in 1970. Those years were filled with great promise. Under Allende, the country’s copper mines were nationalized and the sale of the copper was used to meet the Chilean people’s needs, not to swell the private profits of U.S. corporations. Over 100,000 modestly priced homes were built for workers. Public works programs were launched. Unemployment dropped by half. Land reform brought benefits to small farmers. A free milk program serving the country’s poor children was created. At the government’s urging, workers greatly increased their participation in government. Grassroots democracy flourished, as did popular culture. Indigenous people were reclaiming their dignity. Signs of Villa Grimaldi’s happier days are still evident today in the colorful mosaic tiles that grace the estate’s outer walls. Things changed abruptly, however, when Gen. Augusto Pinochet, backed by the political right and Chile’s wealthy oligarchy, seized power on Sept. 11, 1973. The coup plotters had the full backing of the Nixon administration (including the direct involvement of Henry Kissinger), the Central Intelligence Agency, and corporations like Anaconda Copper and International Telephone and Telegraph. The fascist regime immediately rounded up many thousands of progressive trade unionists, workers, students and political activists. It outlawed the unions and banned public meetings. Days later it closed down the Parliament, an emblem of Chile’s democratic tradition, and imposed a state of siege that lasted many years. Some Chileans, like the great folksinger Victor Jara, were detained, tortured and killed in Estadio Chile, a sports stadium in Santiago. Others were shot and their bodies thrown into the Mapocho River. In the ensuing days and weeks, still others were arrested and taken blindfolded to Villa Grimaldi, which had been taken over by Pinochet’s secret police, the DINA, and turned into an interrogation center. Its external “cover” was that of an electrical utility company. Vehicles would come and go all hours of the day and night. The intelligence agents and the guards at Villa Grimaldi were notorious for their cruelty. Using methods we now associate with U.S.-run torture centers like Abu Ghraib in Iraq or at Guantanamo Bay, prisoners were subjected to relentless interrogation and psychological pressure, accompanied by electrical shock, sleep and food deprivation, and confinement in extremely small, filthy and often excessively hot or cold spaces for days and weeks at time. Hammer, then a university student, had been arrested by the secret police on charges of being a member of a left-wing paramilitary group. “The charges were false,” he said. But that didn’t prevent the secret police from mercilessly torturing him for four months. Their goal was to extract from him the names of other political activists. Many prisoners refused to cooperate and held out to the end. Hammer said his worst day at the camp was witnessing the sadistic torture of a woman by three male guards, who sexually assaulted her with an iron rod. Her screams were horrible, he said, but he could do nothing because he was restrained by another guard with a machine-gun. Hammer said he could not sleep for weeks afterward. Thirty-two years later, his voice still quakes with emotion when he speaks about it. His own life was spared when a United Nations team intervened on his behalf in 1975. Barrientos, our guide, said that in the early years the prisoners could hear the voices of children playing at a day care center just outside the estate’s walls. Victor Diaz, a top Communist Party leader, was among those who were tortured here. His photo appears alongside others’ on a wall in one of the buildings. A former military intelligence agent has testified that after Diaz was tortured at Villa Grimaldi, he was taken to another interrogation site where he was personally visited by Gen. Pinochet. Apparently Pinochet was curious to see what kind of man he was. Victor Diaz was later executed, the agent said. His body has never been found. A similar fate awaited other militants in the Communist Party, the Socialist Party, the Movement of the Revolutionary Left and other left-wing, progressive and working-class organizations. 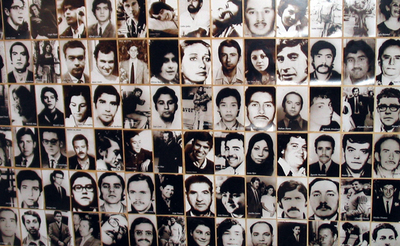 From 1973 to 1990, during Pinochet’s tenure, over 3,000 Chileans were “disappeared” by the fascist regime. Tens of thousands were tortured, imprisoned or driven into exile. A worldwide Chile solidarity movement helped expose these crimes and supported the Chilean people’s struggle for the restoration of democracy. Pinochet died last December. In his last years he had fallen into disgrace at home and abroad. A Spanish judge, Baltasar Garzon, had ordered Pinochet’s arrest in London in 1998 for his crimes against the Chilean people. From then on, Pinochet was almost always under the threat of arrest. But he was never brought to justice. President Michelle Bachelet, Chile’s current chief of state, was also interrogated and tortured at Villa Grimaldi. So was her mother, Angela Jeria. They were detained in January 1975 but were able to escape the clutches of the regime with the help of some military contacts later that year, fleeing to Australia and later, in Bachelet’s case, to East Germany. Bachelet’s father, a general, had refused to go along with the coup. He was tortured to death at a military academy in 1974. The president and her mother revisited the site last October as part of the continuing national effort to come to terms with the bloody nightmare of Pinochet’s rule. When they returned, Villa Grimaldi looked much different than it looked at the time of their imprisonment. The DINA, when it abandoned the property, destroyed almost all the buildings — including the notorious tower where many prisoners spent their very last days — to conceal the evidence of their crimes. But in recent years several of the structures, including the former water tower, have been rebuilt as part of the memorial. The park also has meeting spaces for dramatic performances and other cultural and political events. Despite the restoration of many democratic freedoms in Chile over the past decade, the country is still saddled with the “Pinochet constitution,” a document that is skewed in favor of the interests of foreign corporations, big business, the military and the conservative parties. The struggle to democratize the country remains a high priority. Chile’s trade unionists and students are once again picking up the tempo of their struggles for justice, national sovereignty, democracy and equality. Barrientos told us that the movement to uphold human rights, to uncover the truth of what happened under Pinochet, and to hold accountable those who committed the crimes against humanity continues to be strong. Just before our return home, a delegation from the Observers of the School of the Americas in Chile visited the U.S. Embassy in Santiago to present Ambassador Craig Nelly with a letter. The letter expressed support for HR 1707, a bill introduced by Rep. James McGovern (D-Mass.) in the U.S. Congress, which would close the so-called School of the Americas in Fort Benning, Ga. The school was responsible for training some of the worst henchmen of Pinochet’s fascist regime. The delegation called for a full investigation of all the crimes, in Chile and elsewhere, committed by the school’s graduates. It also called for the freedom of U.S. activists imprisoned in the U.S. for having committed nonviolent civil disobedience in protests against the school. Ambassador Nelly apparently wasn’t in. But he undoubtedly got the message that the quest for justice, and the bonds of solidarity between the U.S. and Chilean people, have not been extinguished.